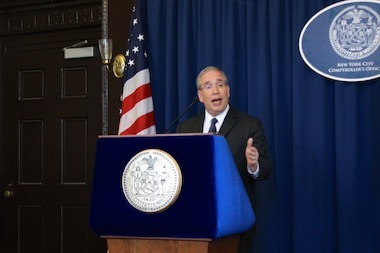 Comptroller Scott Stringer presented his review of Mayor Bill de Blasio's executive budget on June 4, 2013. CIVIC CENTER — Providing city workers with the same labor deal teachers got would cost taxpayers $19.6 billion over the next seven years — a price tag $2 billion above the figure offerred by Mayor Bill de Blasio’s administration, according to City Comptroller Scott Stringer. But healthcare savings touted by the de Blasio administration should cut the cost down $7.3 billion over seven years, Stringer said during an analysis of de Blasio’s $74 billion executive budget Wednesday. “The health care system has not been looked at in decades,” Stringer said. “What we have here now, is, obviously, labor, incentivized to identify savings, [and] a mayor who has to protect the integrity of the four-year financial plan. The budget review comes less than a month after de Blasio's office was convinced to change its budgeting practices over concerns raised by Stringer's office. Stringer’s estimates include costs, such as the impact of the raises on pension costs, that de Blasio’s projections don’t fully capture, both the mayor and comptroller’s offices said. However, Stringer’s total costs for the labor deal — with the savings the mayor’s office are promising — comes in slightly below de Blasio’s estimated cost, according to the mayor’s office. Stringer praised the potential agreement, saying the city deserved credit for setting the table for settling the city’s outstanding labor contracts with the UFT deal announced last month. Stringer also projected smaller budget gaps over the next four years than de Blasio’s estimate — for example, just under a billion in fiscal year 2018, versus the mayor’s $3.1 billion expected hole. Overall, Stringer’s estimates included $5.4 billion in additional funds not seen in de Blasio’s budget, driven by higher personal income and property tax receipts. “I think this economy is getting better, but we also have to be cautious [and] maintain our fiscal integrity,” Stringer said. “Neighboring states like New Jersey, which have over-projected revenue and now face huge deficits, make clear the importance of caution,” she said. Beyond the labor deal, Stringer promised to proactively find ways to extract savings out of city agencies through his auditing powers. Pushing for efficiencies in city agencies could save the city hundreds of millions of dollars, and was necessary to keep the financial health of the city intact. “If city agencies won’t do this, as comptroller, we’re going to go through agencies and help them identify inefficiencies,” he said. Job growth has been slowing in the city since early 2011, and the types of jobs that are created are increasingly low-wage jobs, posing a threat in the future to the city’s financial security. “This is a trend we’ve got to reverse,” Stringer said.